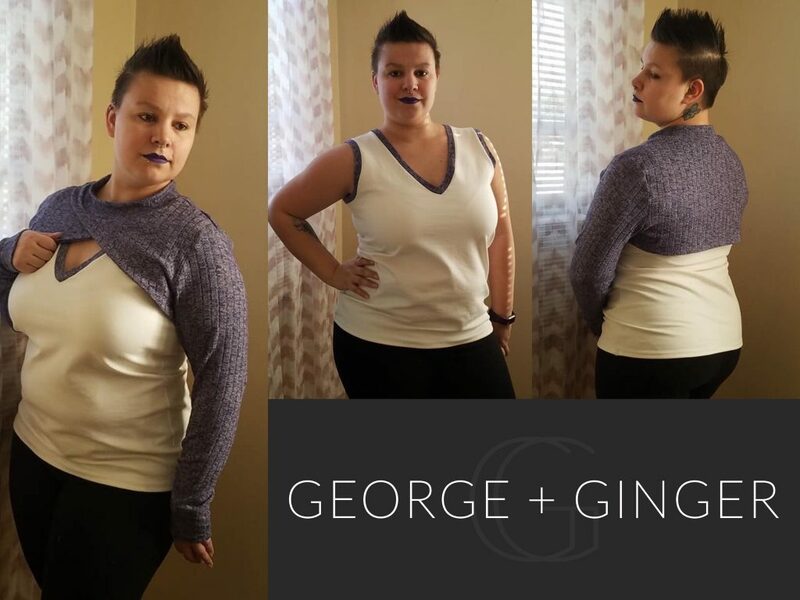 I had to joy of participating in a pattern test for George and Ginger for the Romy Set. Now I’ve taken that pattern and given it a new look. The original Romy Set lined simple bolero and fitted tank. Today I will be going over how to make this pattern completely reversible so you get two great looks in one bolero. You will first need the Romy Pattern to begin. You will only need the front and back pieces for the simple bolero. 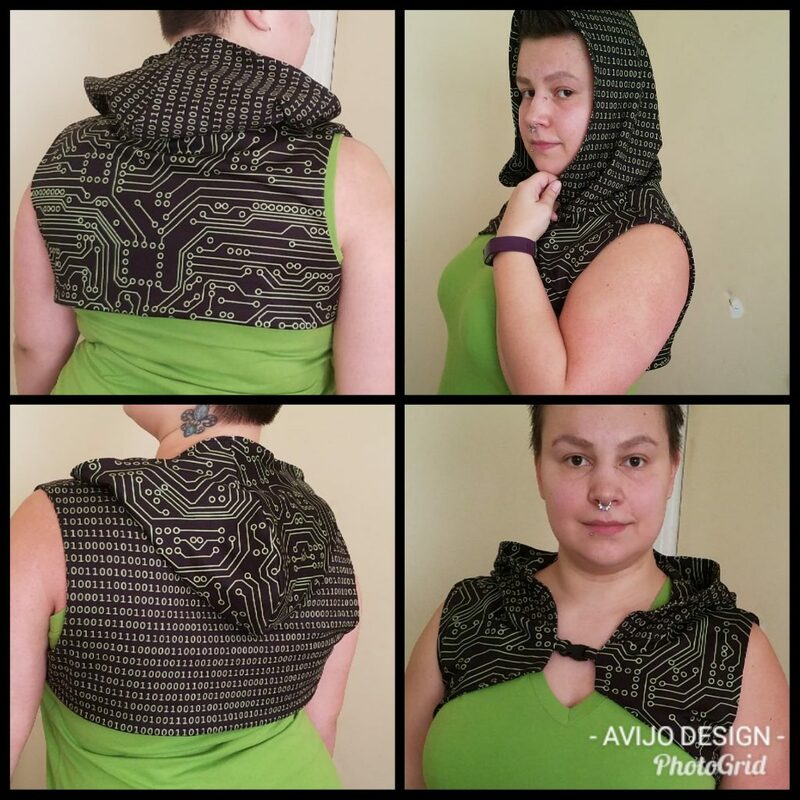 I will be going over how to make this into a front opening sleeveless vest with the free add-on. The add on will be available from the Sew Along Group starting FEB 11th. I will add notes at the end about sleeves, closures, simple neckband, and a closed reversible option as well. Supplies: About 2 yards of fabric (may need more based on size and directional fabric), thread, and a small parachute clip. To start: Select your fabric and print your pattern. Now with the front simple bolero piece you will find the center and mark it. I choose to fold mine back so that I don’t have to reprint should I make the pattern as specified. You will make a similar modification on the hood piece as well. Now we will take this one side at a time. Take your main layer and sew the shoulder seams. You will take the hood and sew the back center seam. We will then attach the hood to your bodice. Find the center in the back panel and place a pin. The other two pins will go at the edges. Line up your hood with the pins keeping the center back seam lined with the center pin on the bodice back. Slight stretch to fit the rest and sew. You will repeat these steps on the lining portion. Now you have two pieces. Lay one right side up and one right side down over it. You will pin all around it leaving the arm pit connections open and a 4 inch gap at the top of the hood for turning. Sew around (RED) leaving the openings mentioned. Now I am doing a parachute clip to close my vest and have made a small loop of fabric through the clip and on each side of the front closure have placed that within the seam allowance so that when I stitch to close, it will secure the clip in. You will now turn your creation inside out. You will notice the under arms are not sealed. Now we will close those up. Match up your side seams as if you were going to sew them from the right side of garment and pin one side of the corresponding layers together (ie lining to lining or main to main) within its seam allowance. The pinning ensures that in the next step you have not twisted your under arm. This was prior to me figuring out my closure. See clips on hood opening. Now all that is left to do is tuck in your seam allowance on the hood opening and top stitch around the hood. Give it a good press and boom you are done! **Contains affiliate links. No cost to you to use them I just get a little perk to keep doing what I love. Thank you. Regular Collar: If the hood is not for you and you want a simple neck band the construction is similar. 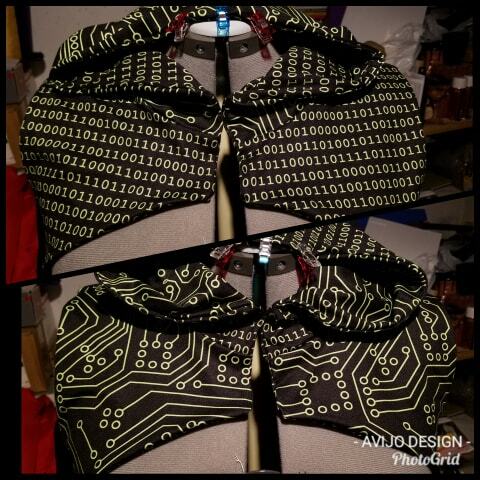 Instead of cutting the neckband as stated you will fold the pattern piece in half length wise (add 1/4 inch seam allowance on top) and cut your main and lining. 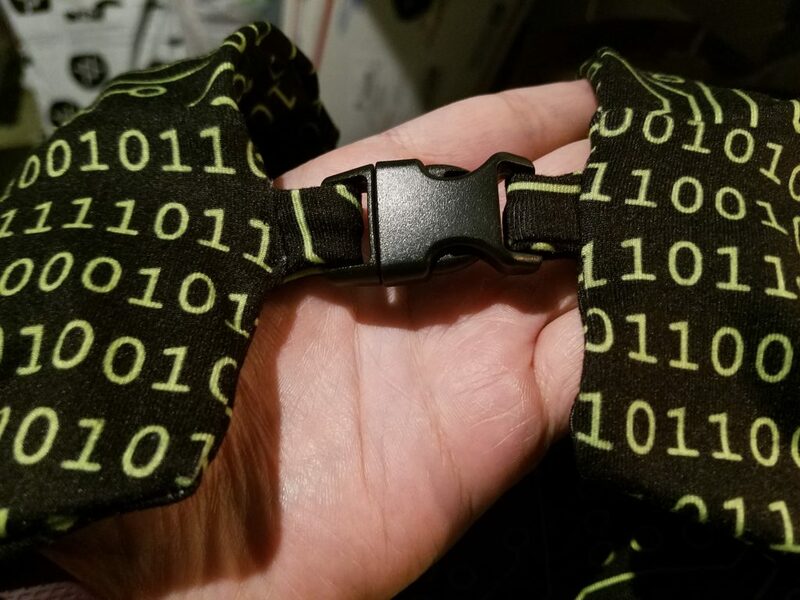 So you have two pieces making up the collar. 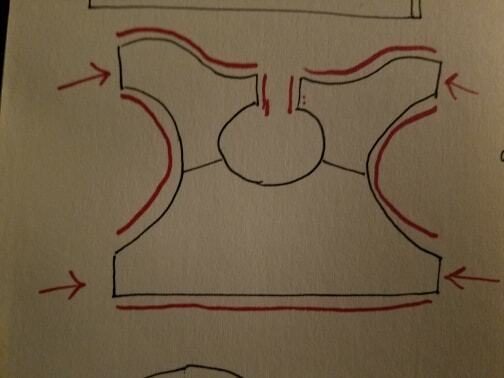 Then construction as described is the same but you will leave a 4 inch gap in the back of the collar. Sleeves: Adding sleeves depending on the length will just increase the amount of hidden seam you would sew on the pull through portion. You will attach the sleeves to the flat lining and main. But just like the side seams you will not sew closed before turning. Once turned you will pin and pull through your opening. Then you will sew and pull back through. You can also after seaming up the sides and arms create the tube with the sleeves to close from the inside vs having to top stitch on the exterior. This would then finish off the side seams and the end of your chosen length sleeve with out the need for a band or hemming. 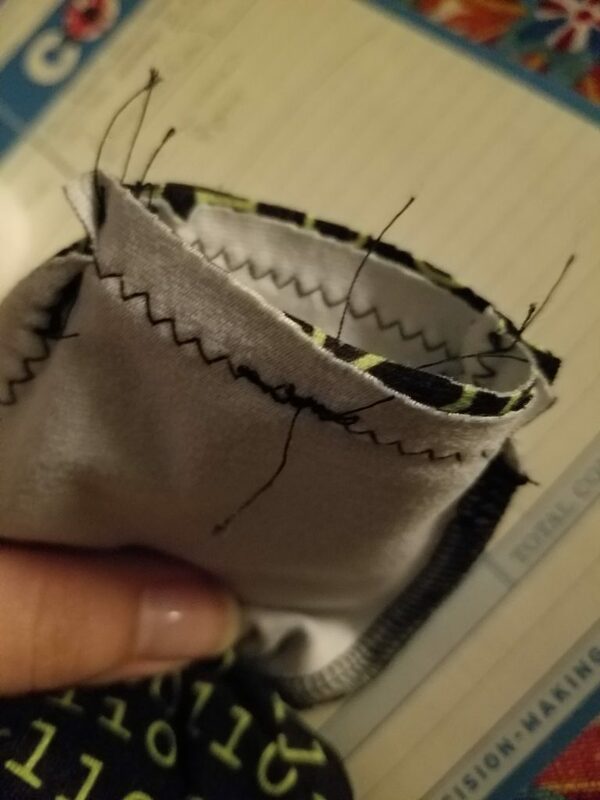 Closures: I choose a parachute clip that needed to be put in the seam allowance if you say use kam snaps or some other closure you can also put them right on the now sewn flaps on the exterior (you may need to add some allowance for them when cutting your pattern vs finding the center). Just remember to reinforce your fabric either with something on the exterior or some knit interfacing on the interior. Closed Opening (no cross over): Now if you like this look but do not want to mess with closures you can do a closed front by cutting the modified front piece on the fold of the fabric. 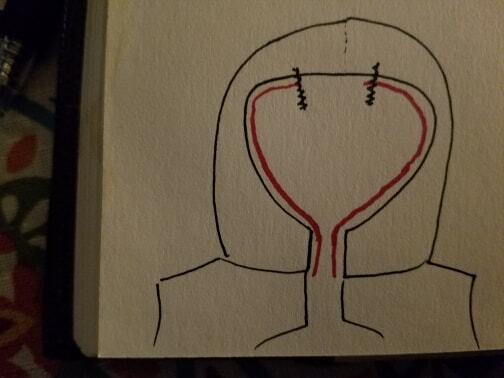 To make this version you can do a modified burrito roll (you would still leave your gap in the collar/ hood so that you could turn this inside out to finish your bottom) then turn right side out and close the hole. Hope that you found some tips to make the bolero of your dreams. Hi. I’m planning on doing the sew along and doing one like yours! So cute! 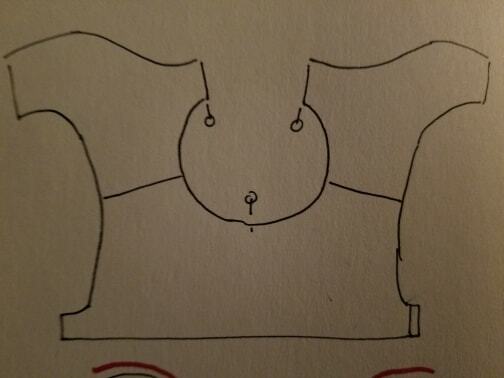 But I’m pretty new to sewing and not understanding parts of what you wrote… It May become more clear as we go along but is there a way to connect with you if I have questions? Would that be ok? That is so exciting! Yes, I won’t be participating in the sew along but I will be there to answer questions if needed. Just tag me in your post or PM me and I can definitely help.